2.) Our options include Sylvinho, a left back more suited to attacking, average (or slightly below) at defending but slow due to his age; Caceres, a young and fast center back very good in tackling but prone to mistakes, he can, contrary to what someone here said, play at left back and has played there before but he hasn't many games under him and I doubt he'll be played; Finally, we may play Puyol, yes you read that right, PUYOL. He has played there before this season and was infact very good and contributed both in attack and defense. If he is played there, we will play a back four of Puyol--Marquez--Pique--Alves. It would give us balance and is my preferred option. However Puyol has to be fit before that and he is expected to be fit just before this game. Not many fans underestimate Bayern, less underestimate the effect of the second leg played away surely the players and coaches won't be. Plus in CL QF onwards any team can beat the other on their day. It would be a classic European night that is for sure. Hello everyone, Barca Fan here, I come in peace ! I have great respect for your club and I believe you guys have a squad full of quality players, Klose, Lahm, Toni, Podolski, Shweinstiger (don't know how to spell that), Van Bommel, and ofcourse Frank Ribery who I pray will come to Barca in the future. Anyways I'm looking forward for the the big Barça-Bayern clash .. and may the best team win ! Snyde is that you ? Bear in mind you Barca fans that we have rocket left wing players: Lahm-Ze-Ribery-Podolski = They all have something in common "SPEED+DRIBBLINGS"
So, no chance of seeing Kloni tandem in Barcelona? How do Bayern fans feel about the most recent controversy surrounding Prinz Poldi and Ballack? Blaugrana wrote: no chance of seeing Kloni tandem in Barcelona? No , he probably won't make it for the secong leg either. Which is a pretty big advantage for you , cause he's been our most consistent and reliable striker up front this season , currently one of the top goal-scorers in the CL. He's the type of striker that doesn't just score goals , but also make runs , works defensively , dribbles and creates dangerous situations in the box , so him missing is a pretty big hit for us. 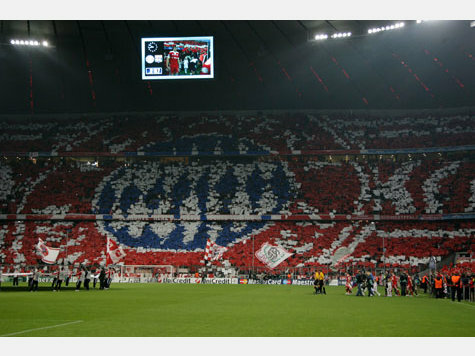 Blaugrana wrote: How do Bayern fans feel about the most recent controversy surrounding Prinz Poldi and Ballack? Podolski was behaving childishly and immature, you don't slap your captain in the face while millions of people are watching , just because he was giving you tactical advises and was telling you to work more defensively. Kuranyi for example was kicked out of the national team for a lot less (he left the game of the German NT at half-time , for those of you who don't remember the incident) , so to be honest I think Poldi should have been suspended as well , but he got lucky. Instead they "just" made him donate 5000 euro for some charity organisation. I hope he learned from this incident and will use his brain next time. That's the face-up I'm looking forward to the most. Should be a joy to watch. Still, at least that might make Barca underestimate Bayern, which is something we definitely want. The loss against Wolfsburg was a little expected. Klinsi said himself that they could only start preparing for the game yesterday due to international duties, but there can be no excuse for the trashing they gave us. I just hope the team doesn't lose its morale. I'm sure we can still beat Barcelona. Barça won their league match yesterday as you know (0-1) Eto'o the scorer by an assist from Xavi. This is a good result for us as we don't usually do well after international breaks but we did well this time and got the 3 points. We rested some key players (Messi and Alves) came in the second half in min.60. Touré as well wasn´t played as he didn´t fully recover yet but he should be ready by Wednesday. Henry was on the bench to but didn't play at all. I was surprized to hear you guys lost 5-1 .. I know you guys we're resting players and taking it easy for the CL match, but still 5-1 is way too much for a team with so much quality. Sadly our players had their minds on the Barca match. Lack of concentration led to Individual mistakes that were behind all Wolfsburg's goals. Taking nothing away from them but the score line doesnt really reflect the match, they just made the most out of our mistakes and scored 4 goals within 15min (two goals in the 62 and 63 min, and the other two came in the between the 73-77 mins). The match yesterday showed how poor our forward line without Klose. I just hope Toni and Poldi can find some chemistry between them for before the match. I certainly hope they don´t :p lol .. I just read a match report and you guys had a strong line-up to my surprize, Ribery, Toni, Podolski .. Btw, I read Lucio got injured ? Will he be fit for the Barça match ? I hope not .. that guy is a monster in defense and he's by far the best center back who can go forward. FCB_Maestro wrote: Btw, I read Lucio got injured ? Will he be fit for the Barça match ? I hope not .. that guy is a monster in defense and he's by far the best center back who can go forward. Lahm - the best LB in the world (?)... calf muscle injury, doubtful. Lucio - the pillar in defence... muscle strain, should be fit. van Buyten - still in Belgium on leave... apparently his father had a suicide attempt. Ribery - the greatest Bayern player... he's got a foot injury and is doubtful. Klose - our best striker this season, definitely out. Toni - just back from injury, not 100% fit.